Setting up your own business is a dream for many and creating a brand that is unusual and memorable is challenging. Outset Bournemouth clients Jadwiga Cwynar and Lucas Dalle Prane have achieved both! 28-year-old Jadwiga is originally from Poland and studied marketing at Aberystwyth in Wales before moving to Bournemouth after living in Bristol. She set up the business with her business partner, Brazilian born Lucas Dalleprane, who works on the IT, website design and search engine optimisation. Jadwiga looks after sales and marketing. Inspired during a Brazilian holiday to the Amazon where they spotted a berry called acai, this young, entrepreneurial business partnership hatched their business plan. Acai is a berry with a rich taste, similar to dark chocolate, that provides a wide range of health benefits – affecting energy levels, mental function, skin, heart, anti-aging and weight loss. Jadwiga & Lucas explored the viability of producing and selling alternative and healthy treats made with acai in the UK. Outset has also enabled Acaiteria to secure a loan from South West Microcredit Fund, the Competitiveness European Regional Development Fund and the South West Investment Group, who also awarded Acaiteria Business of the Month. 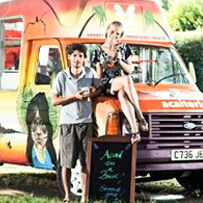 Currently, you can find the funky Acaiteria refurbished ice-cream van at local festivals, events and markets. Their mission is to promote the health benefits of the acai berry by offering delicious sorbets and smoothies to customers, suppliers and local communities. Acaiteria also have website selling acai, nectar, spices and sprinkles, together with providing information and recipes.